Can you be liable for texting the driver of a vehicle? Everyone has seen the advertising campaigns geared against texting and driving. Moreover, numerous states have enacted legislation which makes it illegal to text on your phone while you drive. While those ads and laws have certainly helped curb distracted driving on our roads, is their focus too limited? 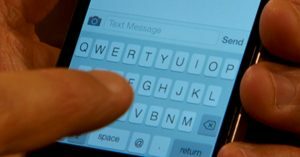 Should we consider not only the conduct of the person receiving the text, but also the conduct of the person sending the text? In a recent opinion from the New Jersey Court of Appeals, three judges agreed with the general proposition that you can be liable if you text someone who you know is driving a vehicle and that person is subsequently distracted and gets into a wreck. In September 2009 a young man was driving down the road as he and his girlfriend were exchanging text messages. The plaintiffs, a married couple, were driving in the opposite direction on their motorcycle. As the young man drove down the road, he became distracted from the flurry of text messages and he allowed his truck to drift across the double center line and hit the plaintiffs’ motorcycle head-on. Seventeen seconds elapsed from when the young man received the last text message until he dialed 911 to report the incident. As a result of the collision, the plaintiffs were caused to suffer serious injuries, including but not limited to, the complete loss of each of their left legs. The plaintiffs brought suit against the driver of the car AND the sender of the text messages under the theory that the texter was responsible for distracting the driver and thus ultimately responsible for causing the incident. The plaintiffs settled with the driver before trial, but lost to the texter at trial. On appeal, the plaintiffs’ attorney argued that the texter was electronically in the car with the driver and thus should be treated like someone sitting in the car willfully distracting the driver. The three judge appellate panel agreed with the plaintiffs’ over-arching principle and held that “the sender of a text message can potentially be liable if an accident is caused by texting, but only if the sender knew or had special reason to know that the recipient would view the text while driving and thus be distracted.” Ultimately, the appellate court ruled that the texter did not have sufficient knowledge that her boyfriend was driving and let her off the hook. However, in handing down its ruling the New Jersey Court of Appeals created a wrinkle in the case law, which may provide an avenue for potential recovery in texting and driving cases. Where does this leave the legal landscape? Many questions arise out of the recent appellate decision; first of which is, what degree of knowledge is necessary for liability to attach? Do you have to know beyond a reasonable doubt that your text recipient was driving? Do you have to be substantially certain of these facts before you can be found liable? Or will a mere preponderance of the evidence standard suffice? This standard may be determined be the court in which the case is filed. For instance, in a criminal negligence or criminal battery case the standard may be beyond a reasonable doubt; whereas in a civil case the requisite knowledge might be preponderance of the evidence. However, the evidentiary standard may very well be determined independently of whether the case is pending before a criminal or civil tribunal. For example, in order for a medical expert to give an opinion in a case, whether the case is pending in criminal or civil court, the proponent of the expert must prove that the opinion is to a reasonable degree of medical certainty. Another question which may arise is whether, after a plaintiff has proven that the texter knew the recipient is driving, the law would create a rebuttable presumption that someone who receives a text while driving will read it and subsequently become distracted? Or does the plaintiff also have to prove that the driver looked at the text and subsequently became distracted from the text message and not something else in the car such as the radio, navigation, or a beverage? The law in Alabama has already created many rebuttable and irrebuttable presumptions that apply once another fact is established. For instance, in an Alabama civil trial, if it is proven that a plaintiff is between the ages of 7 and 14 years of age, then there is a rebuttable presumption that the child is incapable of committing negligence. In the same vein if there is a rebuttable presumption that says that a driver of a vehicle will read all texts sent to him or her and will subsequently become distracted by those texts, then it would be much easier for a texter to become liable for a plaintiff’s damages. Finally, can the general principle espoused by the New Jersey Appellate Court apply to more than just texts? Does it apply to any electronic notification that would cause a driver to avert their eyes from the road and look at their mobile device? Everyone is familiar with the popular ride share programs, such as Lyft and Uber. If you are not, here is a crash course on how they work. A passenger summons a driver of a ride share by sending a text notification through the app to the driver’s phone. The driver then confirms the ride and uses his or her map to come and pick the passenger up. Based on New Jersey’s recent opinion it begs the question of whether a person requesting a ride share can now be found liable if their driver has an accident while confirming a pick-up? Moreover, what if you tag someone in a picture on Facebook or Instagram and you know that they are driving and that they have their notification alerts turned on via their phone? Can you be liable for “liking” someone’s post? These are only some of the several questions that will arise as the courts sift through this new body of law. Unfortunately, like many of the landmark cases before it which also created novel questions of law, we will have to wait many years to get the answers to our new founded questions. The Law Firm of Hollis, Wright, Clay & Vail practices daily facing all the challenges that civil law has to offer including serious personal injury and wrongful death resulting from motor vehicle accidents, premises liability, products liability and dangerous drugs and medical devices. If you or a loved one have been harmed in an accident, contact the Law Firm of Hollis Wright for a free consultation. All cases at Hollis Wright are handled under a contingency fee agreement, which means there are no fees or expenses unless we obtain a recovery for you.